Full Body Workout Vs. Split Routine: Which Is Better? 1 Comment on Full Body Workout Vs. Split Routine: Which Is Better? I’ve spent more time than I would care to admit pondering this question and I’ve spent years of my life experimenting with various full body workouts and split routines. I understand how confusing and frustrating this question can be. For example, tons of smart trainers I know who have great physiques focus their strength training workouts on split routines. But yet they train every one of their clients with full body workouts! Just so we’re on the same page, a full body workout means you are exercising your entire body with all muscles being stimulated in one workout, where as a split routine (aka training split, or body part split) you separate your muscle groups, or movement patterns on different days. For example, if you are working out 3 days in a week, you can complete chest and back exercises on one day, legs on another day, and shoulders and arms on the third day, which is a type of body part split. The following will teach you about the pros and cons of full body workouts and split routines so you can decide which type of routine is right for you. – Balanced Body – You will be able to build a well balanced body by hitting all muscle groups in one workout, which is more natural and more closely mimics real life. 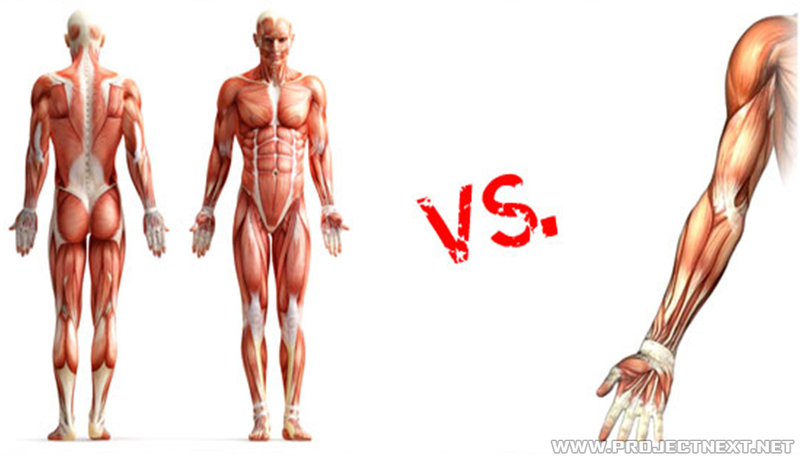 Many physiologists think of the body as one muscle because all muscles are connected to each other, so splitting up the body each workout may not make functional sense. – Miss A Workout, No Biggie – If you normally workout 2x per week and you happen to miss a workout, you have already worked out all your muscle groups with just one workout. Not a big deal. – Maximize Calorie Burn & Fat Loss – When someone has 30lb to lose, I like to keep them on their feet with their legs moving, so full body workouts can work very well. Most smart trainers out there train their overweight clients with full body workouts 2-3x per week. Regarding muscle building, a full body workout can debatably create a more powerful hormonal response to help build muscle, but it’s harder to fully stimulate a muscle with sufficient volume to spur growth. – Can Be Difficult To Focus On A Given Muscle Group – It’s hard to hit a given muscle group, or movement pattern very intensely, especially legs because the intensity can be too tough to handle along with the lengthy recovery time after a workout. – Can Lead To Overtraining – If you like lifting weights 3x per week, doing full body workouts each workout can lead to overtraining if not structured properly. Hitting each muscle group too hard will likely cause an overtraining response. A muscle that has been worked with heavy weights thoroughly (6+ sets) can take a good 5-6 days to recover. – If you really want to do full body workouts 3 or more times per week, you need to change up the movement patterns, lift lighter weights and do circuits, and/or take down the number of sets per muscle group. – Intensity Can Be Hard To Handle – Intensity of full body workouts multiple times per week can be tough to sustain, especially as you become more advanced and start lifting serious weight. In his prime, Arnold Schwarzenegger tried High Intensity Training (HIT), which is a very intense type of full body workout. He said he would rather retire to Austria and become a ski instructor than do those workouts. I can’t blame him. – Superior For Body Shaping – You have more control over the targeted development of your physique. So if you want to spend a little extra time on increasing the width of your shoulders, then you can do that. To my knowledge, there are only a handful of natural bodybuilders and fitness models who do full body workouts consistently, while the vast majority use some type of training split. – Very Manageable/Easier – Lifting weights should never be easy, but if you like lifting heavy, it’s more manageable if you are only focusing on 2-3 muscle groups at a time, or less. It’s less metabolically challenging. – Easy to Switch Up Workouts – Switching up your workout routine can be as easy as changing your body part split so you focus on different body parts on different days (which is what I’ve been doing as of recent), or simply substituting different exercises for a given split. – Less Overall Calorie Burn – If you are doing an arm workout, the calorie burn will be less than a full body workout. There are ways as I describe in my Get Lean Guide for making a body part focused workout more efficient to help burn a lot more calories, but on average, full body workouts burn more calories, sometimes a lot more. – Muscle & Strength Imbalances – Ever see the guy who has arms that are 4x as big as his calves? My guess is that guy is not doing full body workouts, but a body part split routine. If your workout routine is not structured properly, it’s pretty easy to overdevelop certain muscle groups at the expense of others and develop muscle imbalances from both from an aesthetic and strength perspective. – Can’t Skip A Workout – Well you can skip a workout, but it’s problematic. With most training split routines, you are going to hit each muscle group once per week, so if you miss a workout, two weeks will go by before you hit that muscle group again.